Customize wristbands with message to express yourself. Over time, skateboarding has grown into an international activity and sport, with over 12.5 million skateboarders worldwide. Whether for recreational or competitive purposes, skateboarding is enjoyed by many different types of people. Skateboard parks are common around the US, and skateboarding itself is a huge part of the X Games, where pros like Tony Hawk and Shaun White compete for several different titles. For all skateboarders alike, wristbands can be a great way to stand out as a skateboarder. Promote yourself or a player you know by wearing or selling these wristbands with their name, colors, and symbols for that skateboarder. Identify yourself as a skateboarder by customizing your own wristbands. Fundraise for a specific skateboarding organization. 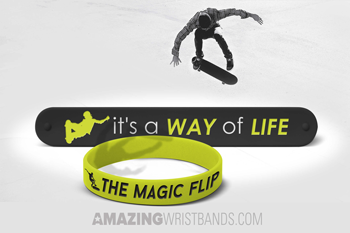 Use these wristbands as rewards/gifts for skateboarders in your life. Order thin quarter-inch wristbands or thick one-inch bands to really make your skateboarding wristbands stand out. The more unique you make your skateboarding wristbands, the more popular they will become! Amazing Wristbands is a leading provider of customized silicone wristbands available online, including skateboarding bracelets. Our wristbands are comfortable, durable, and non-allergenic. Most importantly, our wristbands are your wristbands, and can be customized in a variety of ways. Our professional and friendly customer service agents will help you build your customized bracelet. We offer a wide variety of types and colors to help your wristbands stand out. In addition to standard type, AmazingWristbands.com also offers slap bands, adjustable bands, USB bands, silicone rings and silicone key chains.